On the way down from Aulnay we stopped for an hour or so at Biarritz, just to say we'd been there. We dipped a quick toe in the Atlantic - it's wet, and not very warm - and looked forward to dipping toes in a few other waters over the coming weeks. Quite a few of the other beachside strollers were Spanish - it's only a few kilometers from the border, so it's an easy trip to make, and I suppose they must find it sufficiently different to make it interesting. Next stop San Sebastián - we'll see if we can spot the difference! 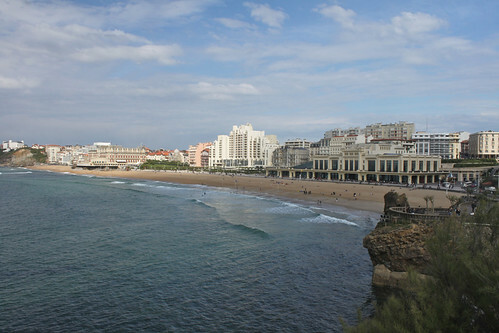 Here's a few Biarritz pictures.